I will start this article with two examples, How websites helped these two persons and how they changed their lives and got financial stability through their websites. Website promotes you 24/7, No employee can do it for you. Example1: Leo babauta of Zenhabits.net. Zenhabits is one of many popular blogs on Internet, Leo babauta is running this blog, He writes about minimalism, decluttering your life and setting goals etc. Zenhabits.net has over 200k subscribers and twice been nominated one of the top 25 blogs by Time magazine. Zenhabits.net was started as a blog on blogger.com once it got popular Leo changed it to WordPress platform from blogger.com. In the beginning Leo put up ads into his blog, But later he designed his blog to be very minimal and removed ads [and comments , sharing buttons to!] and he earns money by selling his books and courses. A normal house wife from a rural place in India now have a business with Franchises around the Globe, Kalpana Rajesh started wedding flower accessories startup back then in 2012, since then she was never looked back and now she has a total of more than 45 branches all are worked under the franchise model, They are spread in all the southern states of india and in Delhi,Mumbai,Sydney, Singapore and U.S.
Kalpana Rajesh started small, She started sharing her products pictures on her Facebook page and got orders for her products. Then she started the website pellipoolajada.com and got popular all over the places and started franchises model to expand her business. She earns money from selling her products online through her website and from franchises. Do i really need a Website? YES, everyone who wants to have a online presence needs a website, If you are into a business then you definitely need a website.If you are an individual you need a website to showcase your portfolio or resume. If you are willing to sell a product or service online then building website is your first step to get leads. You can sell through Amazon or through Facebook store but If you have a website then people treat you as a brand rather than a single person. When we are discussing about how to start a website it is important to know the difference between website and Web Application, For example if you are starting a website about benefits of journaling then it is a website, Where as you launched an application along with your website where people can actually register/login and write their journal online , then it is a web application. Web Applications are generally too complex and takes more time and resources to build than a website. 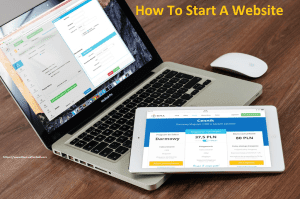 Starting a website is really simple, Either you can do it on your own [Yes, WordPress makes it easy to build websites on your own easily] or you can hire someone to create a website for you, But be careful to choose a company or freelancer and don’t forgot to do research before selecting one to build your website.